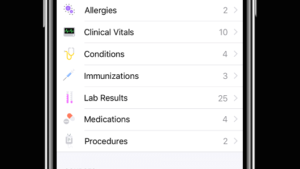 Medical Records on Your Apple iPhone: Will It Help the Patient Experience? Mainstream technology is beginning to create patient-doctor relationships that are unprecedented. CNBC reports that Apple is moving deeper into healthcare with a service that lets users easily view their medical records. Ultimately, “we’re hoping to enable richer conversations between doctor and patient,” said Sumbul Desai, Apple’s digital health lead who’s also a physician and medical researcher and formerly worked at Stanford. In a modern “consumer-focused” healthcare environment, it also underscores the importance of keeping your revenue cycle engine and data absolutely up-to-date, as consumer-level data is getting more and more sophisticated. Physician group of large hospital system accepts me as a new patient. Month ahead before appt., a request goes out to get my old records…unsuccessful. New patient paperwork highly redundant, as I’m filling in forms for 15 minutes about myself. Then when I get into doctor, I have more forms to fill and they ask me many of the same questions. Blood draw is very efficient from onsite lab. Unfortunately, physician never calls me back. I have to call him about 2 weeks later. Labs never made it to my online access. My prescription is going to run out. My doctor is out of town on vacation. Prescription gets rejected, no one tells me. I decided to switch physicians. After a few calls, I finally get an appt. When I arrive for my visit, they thought my previous doctor was a different entity. After exam, my prescription is ordered…to the wrong pharmacy…again. I arrive for lab draw. I am informed my insurance (BCBS Anthem) is no longer accepted, and I have to drive to a different lab location. Miss an important business call. EOBs arrive with wrong information. Something’s denied I guess. So now I start calling around to find out why. And I’m just one patient. Is this the client experience we want to deliver? Perhaps technology will drive improvements, but it’s also about process. accountability, and controls. Let’s not forget about them as well.